As part of our program, we needed to do long runs every weekend. The only way we can do this is if we join races as we tend to procrastinate. At least if we joined weekend races, we would be obligated to do the long run training. Globe R4H would be my 3rd half marathon so I decided to help pace Noy for a PR. I promised him that we will cross the finish line together, hand-in-hand. Noy had doubts but I was determined to prove him otherwise. Unlike any previous races, Noy actually woke up earlier than I did. I was negotiating with my alarm clock as I felt really lazy to get up. Me…lazy for a morning race? What was up with me! Truthfully, I had pre-race jitters as I was scared to feel this annoying pain on my right leg. Stubborn me, didn’t want to take time to see a rehab/sports doctor. We rushed to Makati and had an easy time finding parking. Ahhh…the benefits of being early. After the photo opps by the finish line with the Takbo.ph peeps, stretching and some exercises, psyching myself that my right leg won’t act up, the countdown began and off we go. The unique course took us along Ayala, Dela Rosa, Greenbelt tunnel, Makati Ave then finally Buendia. I told hubby to stay close and keep pace with me. Apparently, he didn’t do what he was told as I lost him less than 1km in the race. I had to wait for him by the Greenbelt 5 tunnel. Noy stayed with Pepsi, Carina, Julie and Marvin instead. The girls (+1-Marvin) were reproaching me for not waiting for Noy as I initially committed. Oh well, I learned my lesson and stuck to my man from the onwards. By the time we reached the Kalayaan flyover, enroute to Fort, we lost sight of the girls +1. Hubby wanted to catch up with them so he ran full speed ahead and left me. The nerve! I waited for him only to be left behind? I don’t think so! But I kept my cool knowing that he’ll run out gas soon. And it came, sooner than I thought. I caught up with him before reaching Burgos Circle. Ahhh…the familiar grounds of Fort. Fort is my playground and I just love running on a familiar route. Before reaching Heritage Park, we saw my halimaw Tito Jombet already on the way back to Makati. Results were out as of press time and he was able to beat his PR ending his HM in 1:55 mins. When I was a kid, we lived near a cemetery. As I visited my dad often in the cemetery, it became a recreational area to me. I used to bike, skate, and have picnics in Eternal Gardens. I felt relaxed and at peace while running inside Heritage Park. Noy was already struggling at this point. We saw Jet and Rod taking their time inside the cemetery. Jet was wearing spanking new Nike running shoes, an impulse buy he said. I was itching to sprint to the finish line as we were crossing Paseo de Roxas and tried to push Noy to run with me to the finish. But his cramping legs prevented him from doing so. So instead, I waited to him and hand-in-hand, we crossed the finish line with a time of 2:56, a PR for my hunny! I learned a few things after this experience. You need not to aim for a PR on a race to have fun. 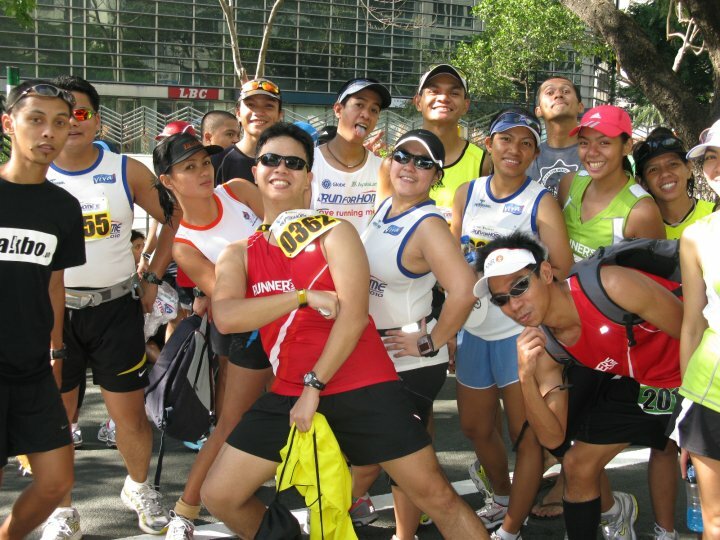 Running can actually be a team sport where you motivate other people to run and receive the same from others. Makati is pollution free during wee hours of the morning. Trust me, I thought otherwise. Use Ice for immediate relief of cramps. Must be the numbing sensation. I never had problems with cramps and I don’t want to experience it. I really don’t mind running with bandit runners and they’re actually not too bad…until they start to litter the streets with cups and Powerade bottles which they shouldn’t have drank from in the first place! I will never run with hubby again…..well from now until Tuesday next week anyway. How did I find the race? Race route was unique and very challenging. There were enough marshals to make me feel secure. Powerade and water cups were aplenty. No medals?…then again, proceeds were for building homes for the marginalized. All in all I enjoyed the experience. See you on the next race! congrats gail & noy!!! woot!!! LOL Rod! Aba syempers! =) Nakalimutan ko nga ilagay na sana nag impulse shopping din si Jet for us, his friends…LOL! Cge pace mo kami! I think pwede naman eh. Rach, I’m pretty sure Noy was smiling not because he finished with me but because he finished. Haha! See you soon! That is so unfair!…But kinda true 😀 2:30 was MY time! huhuhu! You’re a halimaw in my book Tito Jombet! Mwahhhh! Love you! Nice post! Congratulations! Hahaha I can relate to that feeling of not wanting to run with the hubby ….I always swear I don’t want to run with my husband I feel pressured and tired. That’s why on races- I always run alone…he can’t stick with my slow pace. I always dream of someday keeping up with him or beating his finish time LOL. Thanks Julie! I’m sure you and Mike will be like that soon! I meant that you will be pacing him too! hahaha! Haha, ang kulit n’yo when I saw you guys together. Hahaha. hay! kulit lagi ni hubby 🙂 hay trace, buti wala ka dun or else iniwan mo na kami. lol!